CBSE Syllabus For Class 7 English: English is one of the important and compulsory subjects in CBSE upper primary level. Knowledge of English is very important for you not only for the annual exams but also in various fields all through your life. Having a good fundamental knowledge of the English Language and Grammar is very important for every student. English is a subject that has great importance in today’s world. Thus, you must start strengthening your knowledge of English from a young age. In order to help you with that, we bring you the CBSE syllabus for Class 7 English. Go through the article and find out the detailed syllabus. Let us go through the chapters which you need to study in Class 7. 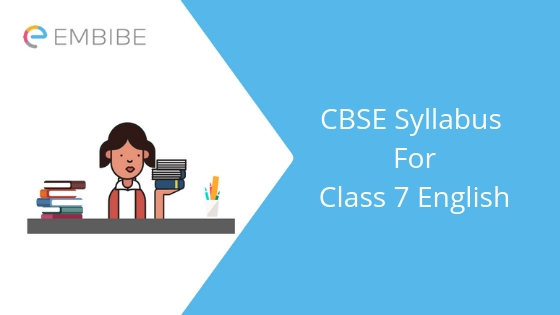 You are now aware of the CBSE syllabus for Class 7 English as per the NCERT books. English is a very scoring subject once you have a fair knowledge of it. Go through the syllabus and prepare well for the subject. Develop your ability to read and understand the language. Besides that, practice well and boost your confidence for the exam. Note that the knowledge that you gather at this stage will act as a foundation for you and help you in your higher classes. So, you must take your studies for Class 7 seriously. Finish the CBSE syllabus for Class 7 for all subjects thoroughly and practice as much as possible. It will be of great help in shaping your future. We hope this article on CBSE Syllabus For Class 7 English helps you. If you have any question, feel free to post it in the comment box below. We will get back to you as soon as possible.